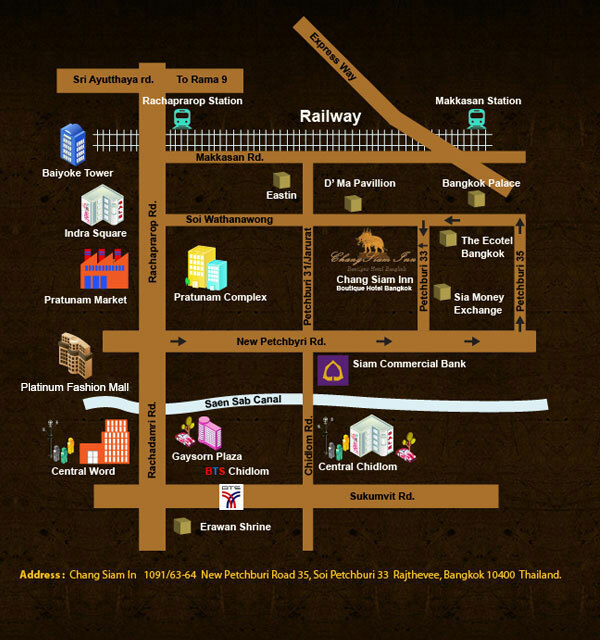 Chang Siam Inn is located just 10 minutes' walk from the Rachaparop train station, which connects to the city-wide rail network and links to Suvarnabhumi international airport, which is just a 20 minute ride by train. We are also situated near some of Bangkok's best international hospitals, including: Bumrungrad Hospital; Rajavithi Hospital; The Children's Hospital and Ramathibodi Hospital. Of course, Bangkok is well known as a great place to shop by day and a wonderful place to relax by night. Nearby you'll find streets lined with market stalls as well as high-end shopping malls. See the list below for more info. Prathunam Textile Market. Clothes and accessories of all kinds available retail and wholesale at hundreds of stalls under one roof (10 minutes by walk). MBK Center (Maboonkrong Shopping Center). A multi-storey discount mall with clothes, electronics, mobile and travel accessories, banks and restaurants. Siam Paragon. A trendy up-market mall stocking leading global and luxury brands. Next door is Siam Centre, sporting a variety of small shops (15 minutes by car/taxi). Central Chidlom Shopping Mall. Recently renovated, Central Chidlom was one of Bangkok's first department store malls in Thailand and is recognised for its high-quality products (10 minutes walk). Patpong Night Market. A must-see for every visitor to Bangkok. Probably Bangkok's most famous street, Patpong is a night market selling every kind of souvenir imaginable and lined with entertainment venues for every taste (15 minutes by car/taxi). Nana Plaza. Another nearby night spot with extreme entertainment just off Sukumvit Road (10 minutes by car/taxi). King Power Duty Free Mall. Do all your duty-free shopping before you leave at King Power (10 minutes by car/taxi). Pantip Plaza. One of Bangkok's biggest and best-known IT malls, stocking every kind of hardware and software you need to stay connected, all at reasonable prices (10 minutes by walk). Chatuchak Weekend Market. Open Saturdays and Sundays, Chatuchak ("JJ") Market is one of the largest markets in the world and almost impossible to see in its entirety in a whole day. Handicrafts, home décor, jewellery and many, many things more can be found at this massive market (30 minutes by car/taxi). Express Airport Rail Link. Chang Siam Hotel is just a few minutes walk from Rajaparop Sation, a main stop on Bangkok's mass transit system, which has an express train directly to Suvarnabhumi Bangkok International Airport. Most other parts of the city can be reached in under 30 minutes using the inter-connected railway and subway.